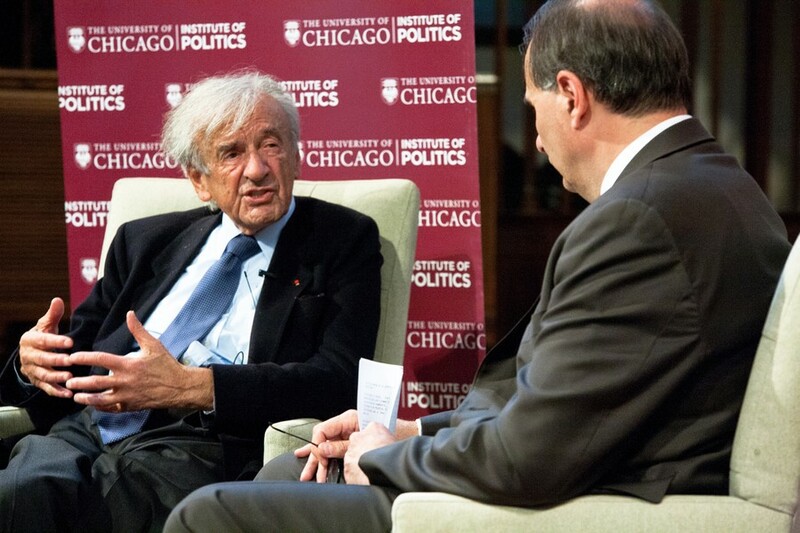 Holocaust survivor and Nobel Peace Prize winner Elie Wiesel reflected on the nearly seven decades since his traumatic childhood experience in the Auschwitz and Buchenwald concentration camps in a conversation with Institute of Politics (IOP) director David Axelrod (A.B. '76) on Wednesday evening. In the culminating event of the IOP’s inaugural year, Wiesel spoke at a packed Rockefeller Chapel—the largest indoor venue on campus—for what turned out to be the IOP’s most popular event yet. The author of 57 books, Wiesel, 84, has spent his life speaking out against injustice and genocide all over the world. The Nobel Peace Prize committee called him “a messenger to mankind” for his work raising awareness of the Holocaust and other human rights violations. Recalling Wiesel’s visit to Buchenwald with President Barack Obama and German Chancellor Angela Merkel in 2009, Axelrod said that he asked Wiesel how he could stand side by side with German authorities. “The children of murderers are not murderers,” Wiesel responded at the time. In his questions, Axelrod inquired into what enabled Wiesel to endure the camps and retain optimism in humanity despite the atrocities perpetrated against him. But Wiesel did not seem to share this view, as he began one response to a political question by positing, “I don’t like politics.” In general, he focused his remarks on the moral obligation to speak out against injustice. Fourth-year Dory Fox observed tension between Axelrod’s political focus versus Wiesel’s insistence on speaking in terms of morality during the talk. Still, she found inspiration in Wiesel’s words.